HackingChristianity.net is the personal blog of the Rev. Jeremy Smith, a religious professional with a unique audience of religiously-inclined technology enthusiasts, subgenre geeks, and a dedicated audience of United Methodist clergy and laity. Hacking Christianity (HX) has offered high-quality content consistently for over 10 years, developing long-term online relations and local contacts scattered across the continental United States during that time. Advertising with HX solely supports site upgrades and research costs. HX is syndicated on UM-Insight and the Methoblog, often earns media mentions by United Methodist News Service, RMN Flashnet, and MFSA E-News. HX, according to Google AdSense, has 32k average monthly pageviews (17k unique monthly visitors). Each blog post is publicized to 5700 Twitter followers, 6200 Facebook followers, and various smaller social media channels, maximizing the impact of your marketing. Standard Sidebar: The first Box after the Search Engine (wide placement #1, #2) and the first box after the Social Media boxes (tall placement #3, #4). These are the first ads that a desktop viewer would see. 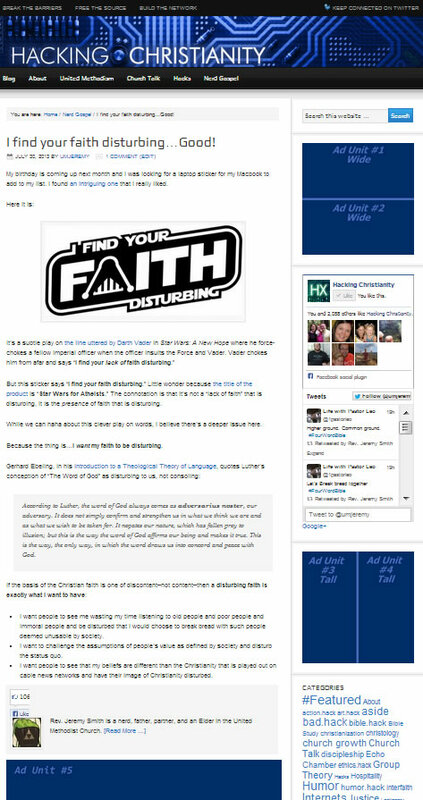 After-Post ad: The horizontal Box after the Author byline (placement #5). This is actually the first ad that a mobile viewer would see. Scroll to the bottom of this post to see where these ad units lie on a typical page. The industry-standard rate for advertising is 20% of the average unique visitors per day, as determined by Google AdSense. With an August 2018 daily average of 566, the advertising cost is rounded down to $100 per month. The industry-standard size of an advertising box is a 125×125 pixel square. Our strategy is to offer more than double the standard size with tall (175×350) or wide formats (350×175) for the $100 monthly rate. A full 350×350 square or the 650×100 After Post Ad Unit is $200 per month. The advertising contract is renegotiable after term, with the price going up or down based on visitors (as determined by Google’s AdSense). All prices negotiable and contracts fulfilled via Paypal invoices. Contact Rev. Jeremy Smith (blog owner) to discuss further options. Click here.